The iPhone XS is Apple’s flagship offering for this year, and it comes with improvements and changes big and small. While the new iPhone XS has an upgraded A12 Bionic processor which results in blazing fast performance, it certainly looks like the iPhone XS got a downgrade in terms of battery — at least on paper. So, if you’re wondering what the battery life of the new iPhone XS is like, well I’ve been using it as my daily driver for over 2 weeks now, and I’ll take you through everything you need to know about the iPhone XS battery. So, the iPhone XS supports fast charging, which definitely sounds like great news doesn’t it? Well, it is, but Apple decided to not bundle a fast charger with the phone, opting to give us a measly 5W charger instead. That’s really insane for any flagship, and especially one that is priced at a whopping Rs. 1 Lakh. Anyway, I tested the charging speeds of the iPhone XS with the bundled charger, and guess what, it’s excruciatingly slow. The iPhone XS takes a full 3 hours to charge from anywhere near 15% to 100%. Don’t forget that charging time is for a 2,658 mAh battery. You could fast charge it if you like (and then it goes from 10 to 50% in 30 minutes), with a 30W charger with Power Delivery, and a USB Type-C to Lightning cable to go along with it, and Apple even sells that for a combined price of $70, but honestly, that’s just disgraceful. I could rant about this all day long, but let’s move on. As you probably already know, the iPhone XS also supports fast wireless charging on the Qi standard. That’s great because it means you can charge the iPhone XS on a number of third party wireless chargers. I tested out the iPhone XS’ charging on the Mi Charging Pad that supports upto 18W fast wireless charging. 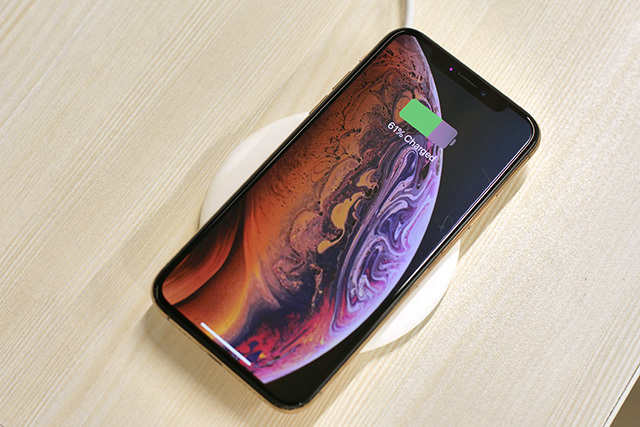 However, even then, the iPhone XS takes 3 hours on the charging mat to go from around 15% to a full 100% charge. I’m not really one to wirelessly charge my devices (maybe that’ll change, but whatever), so it didn’t really bother me that the phone takes this long on the wireless charger. However, if you like wireless charging, this might be something to note. Also, if you’re interested in fast charging your iPhone but you don’t want to spend the $70 on the official 30W charger and USB-C to Lightning cable, we have compiled a list of best fast chargers for iPhone XS, and the best USB-C to Lightning cables for the iPhone XS that you can check out. There are a lot of options there, so pick any that you like. 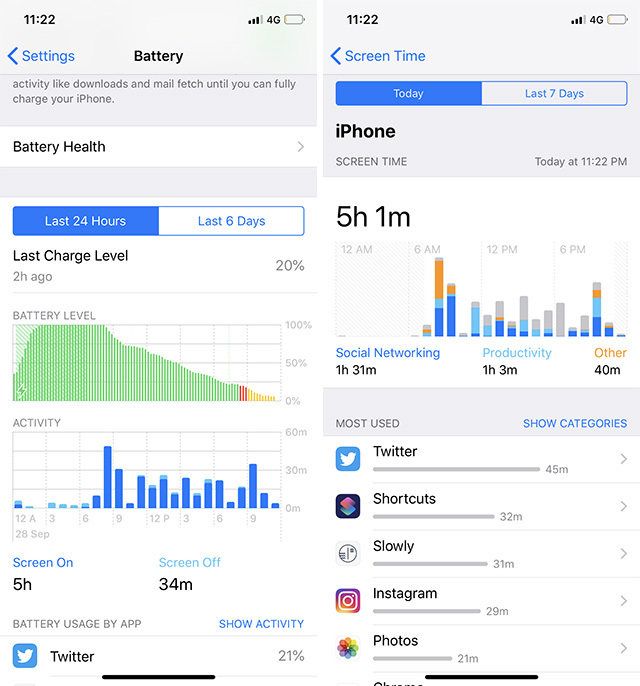 As far as the battery life is concerned, even with a rather tiny battery, the iPhone XS easily lasts through a workday with intensive workloads; and that’s my workday, which means over 14-15 hours, with a lot of Twitter browsing, Instagram usage, taking a boat load of pictures for camera samples, texting people on WhatsApp and iMessage, making a few calls, and playing (mostly casual) games like Alto’s Odyssey. With a usage pattern like that, I noticed that starting the day at 7:30 AM with 100% charge on the iPhone XS, the phone was anywhere around 10% to 15% by the time I got back home at 10:00 PM. I also got a screen on time of around 4.5 hours on average, which is definitely awesome. If you’re wondering how this is even possible, I just chalk it up to the fact that Apple’s hardware and software optimisations are really damn good, and no one comes close. Overall, you’ll not be disappointed with the battery life on the iPhone XS, even though you may be disappointed by the charging speeds and the fact that there’s no fast charger included with the iPhone XS. All things considered, the iPhone XS’ small battery size really isn’t something to worry about. After all, it lasts through the day with ease, and with intensive workloads. If your workload is more on the casual usage side of things, the battery life will be even better, obviously. The only thing you need to worry about with the iPhone XS is the charging speed, and how you’ll manage without a fast charger. I usually just end up charging it overnight.